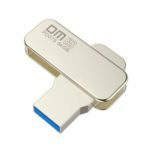 Duo Plus is a type C drive with super useful type A adapter for storage expansion and easy file transfers between your smartphones, tablets, and PCs. USB 3.1 interface redefines everyday file transfers with speeds up to 300MB/s, backward compatible with USB 3.0/2.0. 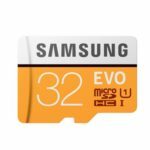 It is a reliable and secure storage for your photos, videos, music, and files. The DUO Plus is a Type-C drive with a super-useful Type-A adapter. Eliminate worries as the intuitive integrated Type-A adapter works with your older devices. The DUO Plus transfers large files in mere seconds with blazing USB 3.1 read speeds up to 300MB/s. 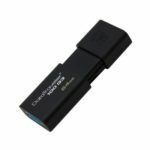 Backward compatible with USB 3.0/2.0, this drive gives you astonishing performance across so many different devices and uses. Sporting the latest USB-C technology, the DUO Plus plugs-in right side up every time – no flipping, no fumbling, no fuss. Transfer large files with ease to your Type-C Smartphones, tablets, PCs and laptops. One flash drive for many devices. 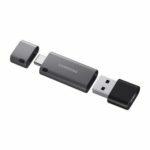 Both USB Type-C and Type-A connectivity, lets you quickly free up device space with fast backups and file offloads. Now you can add even more movies, music and games. 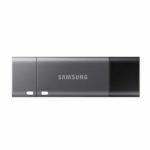 Samsung’s leadership in flash memory makes the DUO Plus a trustworthy drive to store your valuable data. It works through it all with a waterproof, shock-proof, temperature-proof, magnet-proof, and X-ray-proof body, all backed by a 5-year limited warranty.